If you’re like me, the least favorite part of your morning routine is shaving your legs. Shaving takes at least 6 -10 minutes with a razor to get a close shave without nicks and cuts. You have shaving to look forward to every day for the rest of your life if you don’t find the best epilator. Epilators were introduced a few years back that promise to make this time-consuming task a lot less aggravating. You’ll see as time goes by your best epilator will produce finer re-growth and help you get by with shaving less often. Braun GmbH (pronounced “brown”), is a subsidiary of Proctor & Gamble a well-known manufacturer of quality grooming products. The Braun Silk-épil Wet & Dry Cordless Electric Hair Removal Epilator uses a tweezing effect that grabs and pulls hairs out by the roots. If you have ever tweezed your eyebrows, you know how much it stings. This best epilator is equipped with a massage attachment that gently massages the skin as it tweezes the hairs to minimize the sting. Braun Silk-épil Wet & Dry Cordless Electric Hair Removal Epilator removes hair up to 4X closer than waxing. Waxing can leave stubble that the Braun can easily remove since it can grab hair as short as 0.5mm long or the size of a grain of sand. The Microgrip Tweezer Technology leaves your skin silky smooth for up to 4 weeks after a time of frequent use in the beginning. The 40% wider head allows you to cover more area in one stroke. This is a major advantage in cutting down the time it takes you to remove hair. The tweezers of the Braun Silk-épil Wet & Dry Cordless Electric Hair Removal Epilator are longer and wider to reach the shortest hairs. Braun’s contoured head pivots at a 15-degree angle along your curves to give you the closest epilation possible. Enjoy two-speed settings: Speed I for an extra gentle epilation while Speed II gives you more efficient hair removal. The sonic exfoliating brush works along with the epilator to remove dead skin cells leaving your skin ultra smooth. SmartLight Technology helps you see even the tiniest stubble. 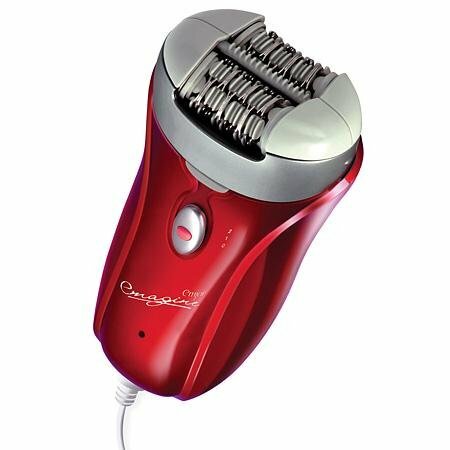 The hair grows back finer and takes longer to return after each use of the epilator. You’ll eventually enjoy smooth silky legs for up to 4 weeks at a time before needing to use it again. You have a choice of using the Braun Silk-épil Wet & Dry Cordless Electric Hair Removal Epilator in the shower or bath or as a dry epilator for quick touch-ups. No oil or lotion is applied to the skin before using this epilator on dry skin. Some customers use a light dusting of baby powder to reduce irritation while epilating dry skin. The head is fully washable under running water. The brush helps to remove stubborn hairs caught in the blades. A complete charge takes only 1 hour and lasts for 40 minutes. That gives you plenty of time to epilate both legs if needed. Make sure to fully charge the Braun Silk-épil Wet & Dry Cordless Electric Hair Removal Epilator before using since you can’t use it while plugged in. The razor’s ergonomic design is comfortable to hold for long periods of time. It fits well in a woman’s hand and reduces accidental dropping. The Braun Epilator comes in white with pink accents which adds to its overall feminine appearance. 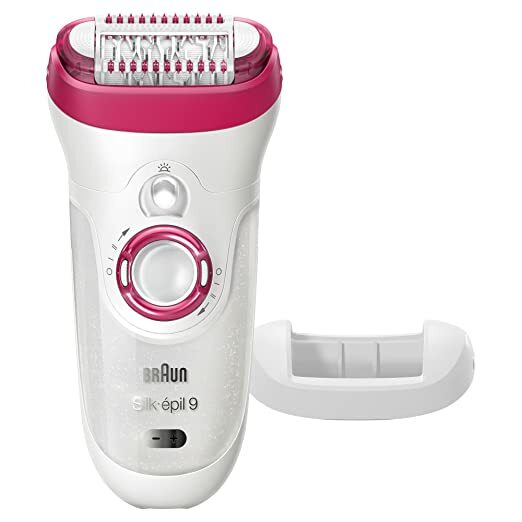 An electric cord, charging stand, pouch, brush, and 2 AA batteries along with 2 caps are included with the Braun Silk-épil Wet & Dry Cordless Electric Hair Removal Epilator. Most of the comments included how painful when using the epilator can be. Customers experienced minimal to major pain. Many of them agree that the first time using the epilator was probably the most painful but as they continued to epilate the pain lessened dramatically. Others used ibuprofen, numbing sprays and baby powder to reduce the pain. A small percentage of customers shared they had no pain at all. The most amazing thing about the Braun Silk-épil Wet & Dry Cordless Electric Hair Removal Epilator is many of the women continued using the product because they enjoyed the results of smooth skin for long periods of time. They feel that the temporary pain is worth it. Tweezer Technology removes hair even closer than waxing. Hair removal lasts for up to 4 weeks. Cordless allows for easy wet and dry operation. Choice of 2 speeds: Speed I for comfort and Speed II for faster removal. Waterproof for use in the shower or bath. 40% wider head covers more area in one passing. Enjoy long-lasting battery life (40 minutes). Ergonomically designed for women for women to hold comfortably. Very feminine colors in white with pink trim. Suitable for every woman and every skin type. Includes power cord, 2 plates, charging stand, brush, pouch and 2 AA batteries. Minimal to maximum pain in the beginning that fades with each use. Facial and underarm attachment not included. The Emjoi Company is the proud creator of the Emjoi AP-18 Emagine Dual Opposed 72 Tweezer Head Epilator. The first sentence in the company’s Mission Statement reads: “To make details of life and personal care as trouble-free and enjoyable as possible.”As we look at this epilator together, you’ll see that the company lives up to its goals in this epilator. They have put the consumer’s need for effectiveness and safety at a reasonable price at the top of their priorities. No other epilator on the market has as many tweezers. We mentioned before an epilator with tweezers works by pulling the hairs out by the root for a smooth and silky finish. You eliminate the need to go over the same area several times that can cause skin irritation with this number of tweezers. Fewer passes over the same area also save time. Another unique feature of the Emjoi AP-18 Emagine Dual Opposed 72 Tweezer Head Epilator is how each set of discs work together to give you the best results for hair removal. The center disc is fixed to lift up hair as short as 0.5mm while the two side discs gently stretch the skin to help remove every strand of hair and do it much more comfortable during epilation. Each set of discs is staggered in order to cover more area. This positioning helps the Emjoi AP-18 Emagine Dual Opposed 72 Tweezer Head Epilator cover a larger area of skin at one time eliminating the need for making an excessive number of passes. You can eventually enjoy the results of smooth silky skin for up 6 weeks after a period of frequent use of the epilator. While the Emjoi AP-18 Emagine Dual Opposed 72 Tweezer Head Epilator is removing the hair efficiently, the Silver Ion Technology is working to reduce the possibility of infection. Silver helps to prevent any possible microbes that may occur during the epilating process. The Emjoi AP-18 Emagine Dual Opposed 72 Tweezer Head Epilator is light-weight (1.4 pounds) and is ergonomically designed to fit in a woman’s palm. You can easily use the Emjoi on any part of the body without fear of dropping it. This feature allows you to choose the intensity you want for hair removal. Emjoi AP-18 Emagine Dual Opposed 72 Tweezer Head Epilator is gentle enough to use on sensitive areas around the upper lip, chin, underarm and bikini areas. Emjoi Emagine is a plug-in epilator not to be used in the shower or bath. You never need to worry about a battery losing its charge or replacement hassles. Just plug it in and it’s ready to go at any time. There’s a 30-day money-back guarantee and a 1-year warranty on the Emjoi AP-18 Emagine Dual Opposed 72 Tweezer Head Epilator. The 72 tweezers are built into 3-way discs that lift short, flat hairs and pull the skin taut for a close and comfortable epilation. Fewer passes over the skin reduces irritation and saves time. Silver Ion Technology reduces the possibility of infection. Ergonomically designed for easy holding. Dual controls offer choice of gentle or effective epilating. Gentle enough to use on sensitive skin areas. Plug in for constant power. Not to be used in the shower or bath. Included with the Emjoi AP-18 Emagine: travel pouch, cleaning brush and instruction booklet. Philips Consumer Lifestyle is a well-known company for personal care appliances. The Philips Hp5620/70 Satin Soft Cordless Epilator is part of the Satin/Soft Epilator line. The Satin Soft epilator works well to effectively remove unwanted hair permanently. 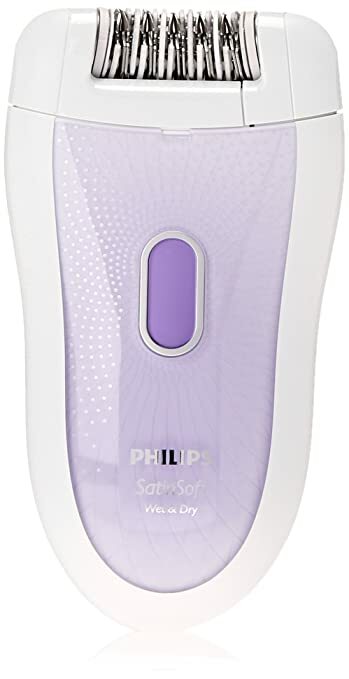 The Philips Hp5620/70 Satin Soft Cordless Epilator uses 21 tweezers to thoroughly and gently remove unwanted hair by pulling it out by the root. Your skin is beautifully soft and smooth for several weeks after a time of more frequent use. This attachment gently massages the skin to make the epilating experience easier and more comfortable. Your skin is never pulled or pinched during the process. Want to use it in the shower or bath? You can with the Philips Hp5620/70 Satin Soft Cordless Epilator. A full charge lasts 1 hour to give your 30 minutes of use. You also have the option to use it out of the shower or bath for maximum versatility. You have a choice of 2 speeds. The lower speed reduces the amount of pulling action you feel to make it more comfortable. The higher speed works at maximum power to remove hairs effectively. It is suggested that new users choose the lower speed until you become more accustomed to the epilating process. This Philips Hp5620/70 Satin Soft Cordless Epilator is specially designed with a woman in mind. It easily fits in the palm of a woman’s hand and is ergonomically curved for easy handling. The outside of the Satin Soft is beautifully feminine in soft white and lavender colors. The Philips Hp5620/70 Satin Soft Cordless Epilator is water-proof which makes it very easy to clean under running water. A brush is included for a more thorough cleaning. 21 tweezers remove hair to leave a satiny finish to the skin. Massage attachment gently massages skin to aid in hair removal and comfort. Cordless operation allows use inside or outside the shower or bath. Easy cleanup enjoyed with water and brush. Full charge lasts only 30 minutes. The Satin Soft Cordless Epilator includes power cord, brush and bag. The manufacturer offers a 2-year warranty. Philips is committed to providing innovative designs in personal care products to consumers worldwide. Don’t let the price fool you. If your budget just won’t allow you to spend $60 or more for an epilator, the Philips HP6401 Satinelle Epilator may be the answer you need. Great for a person who wants to try epilating for the first time or as a gift to a teen. The Philips HP6401 Satinelle Epilator has 21 hypoallergenic tweezers that remove hair efficiently and safely. Hair is plucked out of the skin by the roots for smooth skin that lasts for weeks. The Philips HP6401 Satinelle Epilator offers the choice of 2 speeds: gentle and efficient. Gentle speed works well to remove hair at sensitive skin areas such as underarms, ankles, knees and the bikini line. The efficient setting operates faster on arms and legs. Another feature that helps the user with sensitive skin is the efficiency cap. Skin is protected from harsh epilating while leaving the skin smooth and hair-free. The Philips HP6401 Satinelle Epilator also helps to eliminate nicks and cuts. Philips HP6401 Satinelle Epilator effectively removes hair as short as 0.5mm and up to 1.5cm. The removable head along with the brush allows a quick and easy cleanup for sanitary maintenance. The Philips HP6401 Satinelle Epilator is designed to fit perfectly in a woman’s hand for ease of use. The light in weight (8 oz) and ergonomic design is easy to hold for long periods of time in comfort. This very pretty epilator is white with a soft gray design. The very popular Philips HP6401 Satinelle Epilator received 2,425 reviews at the time of this review. Some customers liked the low price of the Philips HP6401 Satinelle Epilator and felt it worked effectively despite the lower price. Others especially enjoyed the lower level of pain from the Satinelle compared to other epilators. This Philips HP6401 Satinelle Epilator doesn’t work well on course, dark hair. Several passes over the same area left broken hairs. The cleaning brush advertised on the box was not included. 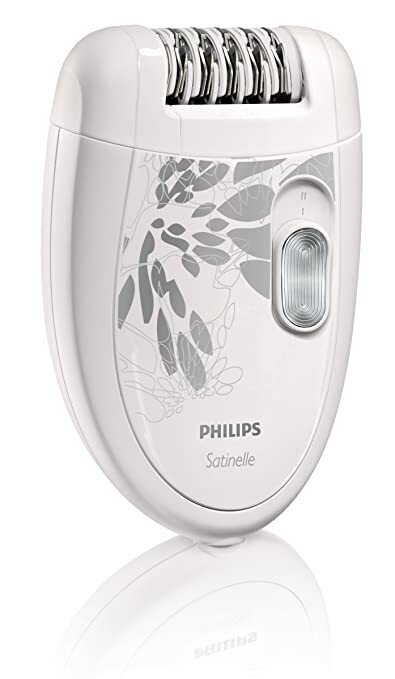 The efficiency cap and the power cord is included with the Philips HP6401 Satinelle Epilator. No matter what features you need or how much money you have to spend, there is the best epilator in this review just for you. You can look forward to a period of days or weeks without having to shave at all. The best epilator is what you need if you want to remove unwanted hair without having to shave every day.